An explosion caused by a Chaos Dwarf in the Lava Flow Mine has the dwarven city of Keldagrim in a state of political unrest. Can you help Veldaban and Meike ascertain the true heir to the throne of Keldagrim? 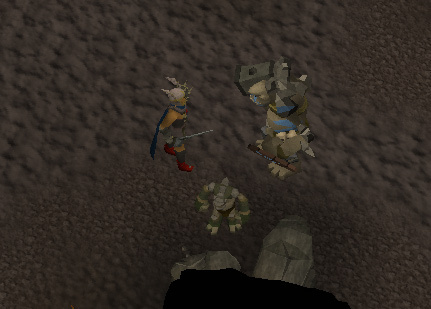 Speak to Sven the lava-flow miner outside the Keldagrim East lava flow mine. 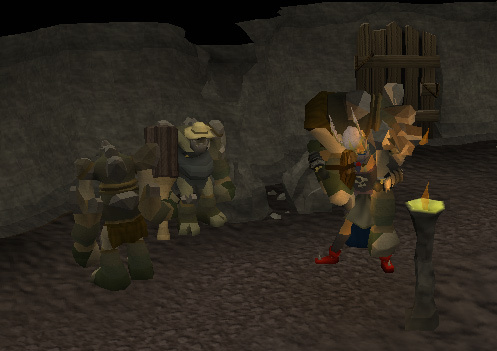 To begin the quest, talk to Lava-flow Miner Sven, who is located along the eastern wall of Keldagrim. Remember your pickaxe! If you forget, there's a shop just north west of Sven's location. Sven offers to give you a tour of the Lava-flow Mine. Once you're ready, you're given the option to start the quest. A cutscene will begin, in which Foreman Jaak will give an explanation about the mine. He notices a cloaked figure in the distance, who turns around and blows itself up, causing parts of the roof to collapse and trap the dwarven miners. You'll be given the task of rescuing them. 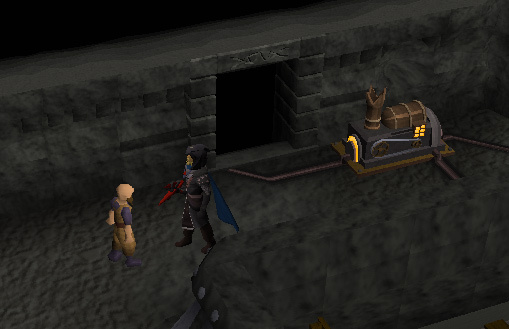 To get to the trapped dwarves, you will need to mine a path through the rubble. However, you can only mine the lighter coloured rocks. You'll be given a message if you try to mine a rock that you're unable to. Keep in mind that you can only carry one miner at a time. Most of the miners survive, however a couple die from their wounds before you reach them. Once this is completed, leave the Lava-flow Mine. 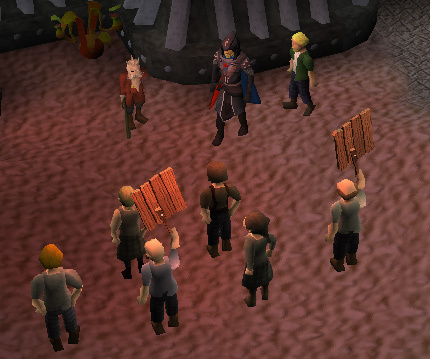 Outside, the former commander of the black guard, Veldaban, is leading a protest about the Consortium. Talk to him and tell him about the events that happened in the Lava-flow Mine. A cutscene will commence and a black guard will arrive and arrest Veldaban on suspicion that he was involved in the incident. Once it's over, you need to head west, to the palace. Head over to the palace and go to the top floor. A cutscene will begin and Veldaban is being accused by the Consortium directors of the attack. He'll ask you to convince them that it wasn't him. Each director has a different dialogue that you need to go through in order to get through the situation. Yellow Fortune Director. Begin with "Why did you arrest Veldaban? ", then continue by saying "Veldaban's popular. Arresting him makes you look worse." Blue Opal Director. Begin with "Tell me about the lava flow mine. ", then continue with "So the chaos dwarf blew up the secondary boilers?" Green Gemstone Director. Tell him "I was there when the explosion happened." Then say "I rescued some of the miners." Brown Engine Director. Say "What did you want to do about the miners? ", Then "It was a difficult decision. I understand." Once this is done, talk to the general secretary standing next to Veldaban. Tell him you've talked to everyone you need to, and he'll call for a vote. The directors decide to free Veldaban. Note: You will now have Veldaban following you. If you somehow manage to lose him, you'll be able to find him in a pub in the eastern side of Keldagrim. A cutscene begins and a member of the black guard will come running in, telling of a sightings of a chaos dwarf army. He'll also say that there are protesters outside, being led by Hreidmar, the leader of the Red Axe. You'll be asked to help deal with the problem. Head outside, on the eastern side of the palace. 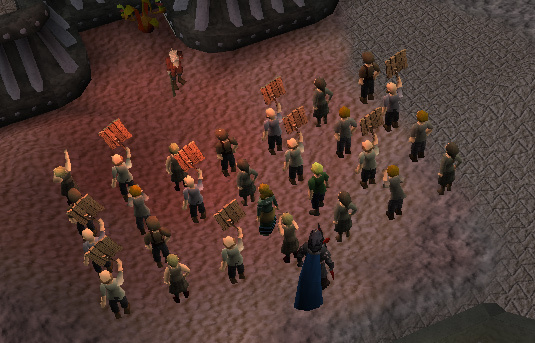 Hreidmar is leading a group of protesters against the Consortium, calling for the Consortium to research the records referring to the descendants of King Alvis so that a new king could be crowned. Veldaban will suggest that you talk to Meike, so talk to one of the protesters about her location. They'll be confused why she isn't at the protest, seeing as she is the head of the Monarchist Society. They'll direct you to the King's Axe pub, where the group usually meets. The pub is just south of the bank, so head over to the other side of the city and talk to Luitger. Inquire as to why he isn't at the protest, and the dialogue will lead to talk of another protester getting arrested. Veldaban suggests that it could be Meike, so you now need to head over to the headquarters of the Black Guard. However, it turns out that Klaas was the dwarf who got arrested, and not Meike. Enter the dialogue and it will end with Veldaban intimidating Klaas into telling the two of you Meike's whereabouts. He tells you that she is in a tower south of the city. This tower is the same one that you killed Hilda in Forgiveness of a Chaos Dwarf. You can find it easily as it is directly south of the western side of the palace. Head to the top of the tower and talk to Meike. Talk to her and when the conversation leads to it, suggest getting into the records chambers. Veldaban believes it to be impossible, but Meike is friends with the curator of the library, which houses the keys. She thinks that you'll be able to handle them enough to have time to make a mould to forge copies with. Veldaban and Meike both say that they will meet you at the library. The bank is on the way to the library so it's easy to get all your mithril bars and soft clay, which you'll need now, as you walk over there. The library is the first building on the western side of the bridge. 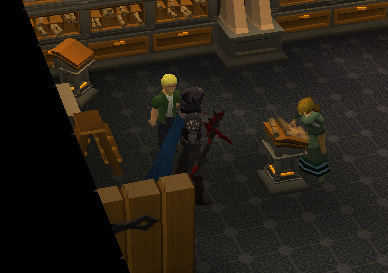 Talk to the librarian and get the key off him to access the cabinet that houses the mithril keys. Open the cabinet and use the clay on it, but the librarian is watching. Meike suggests giving her the clay and distracting the library while she makes the moulds. Give her the clay and talk to the librarian about the keys. While you go through the dialogue, Meike makes the moulds. After you're done, talk to her to get the moulds back, and she tells you to go make the keys. Ironically, there aren't any furnaces in Keldagrim that is suitable for the task, so you'll need to travel elsewhere to make the keys. 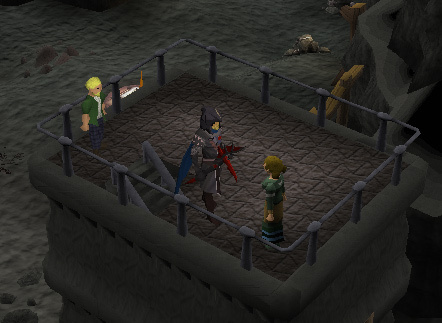 Once you've got back to the keys and travelled back to Keldagrim, you'll find that Meike and Veldaban have gone ahead and are waiting in the entrance to the records chambers, which are just west of the Black Guard HQ. Once inside, she explains that you need to fit the keys into the correct keyholes. This can only be done through trial and error, so if you want to skip ahead of this part then the image below has the correct order. Once you've got the correct order and attempt to open the door, a cutscene will begin. You'll find out that Hreidmar is actually the rightful king, but both Meike and Veldaban strongly believe that he shouldn't be. You end up leaving Meike in the chambers. Note: You will need to gear up for the fight with Colonel Grimsson now. When you fight him, he will attack Veldaban until he has about ¼ of his health remaining. Veldaban has low defence, which means that it's possible for Grimsson to kill Veldaban before you can stop him, which means you'll need to start the battle over. When he turns his attention to you, it'll be worth noting that he uses a mix of ranged and melee attacks. He's weak to stab and you can poison him. Once you're ready, talk to Veldaban and he'll be able to take you to the caves. Head inside the tunnel to the east and follow the main path until you reach Colonel Grimsson. 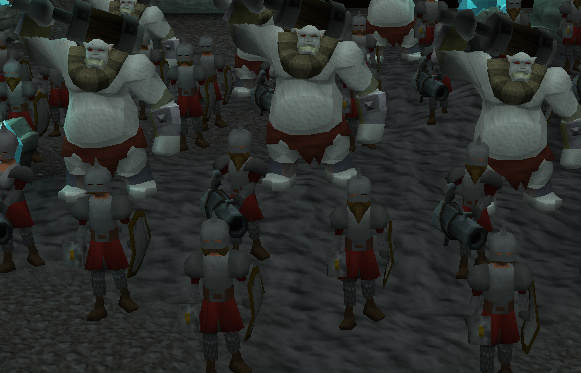 You can try heading into the tunnel entrance north after the battle, but you'll be confronted by the image of the chaos dwarf army and decide not to go through. Talk to Veldaban after the battle and suggest getting reinforcements. He asks where you'll find them, and you pitch the idea of getting the trolls as allies. He disagrees, but you need to follow through the idea, and end up parting ways with him. Head back through the tunnel you came through until you come across a small entrance off the eastern side. Go through it, and you'll come into a cave inhabited by trolls. Walk through until you come across the chief of the troll army, Pretty Flower. Ask to talk to him and he will say you're not worthy. Find out how you can be worthy and he'll tell you to lift Big Rock. Just north of him is a big rock, so lift that. 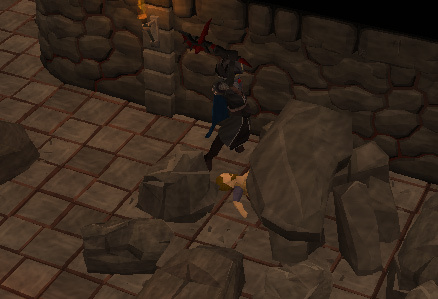 If you have 90 Strength or higher, the rock you lift will stay in your inventory. Talk to Pretty Flower and you'll find out he meant the troll Big Rock. So go and lift him, but you still won't be worthy of talking to Pretty Flower. Talk to My Arm, who is nearby. He'll ramble on and the conversation with lead to talking about Pretty Flower. You get confused because you're talking about the troll, but he's talking about an actual pretty flower. Ask him for one and he'll give it to you. Give it to Pretty Flower and tell him it's a gift from Colonel Grimsson. It'll enrage him because he believes that Grimsson is making fun of him, so will agree with lead the trolls against the chaos dwarves. It's now time to head back to the palace. This time, there will be a much larger protest than before. Veldaban and Meike are in amidst the throng. Talk to them and you'll find that Meike altered the records so that Hreidmar won't be king. A cutscene will commence. 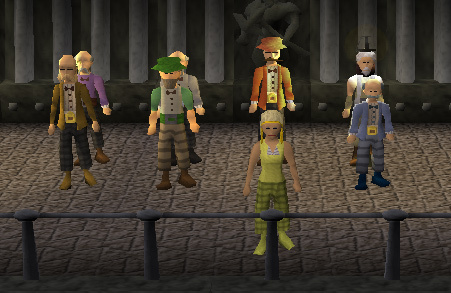 The directors will announce that they opened the record chambers for examination as Keldagrim now needed a king to guide them through dark times. It turns out that Meike altered the records to make Veldaban king. Another cutscene will start, showing Veldaban's coronation. Quest complete! 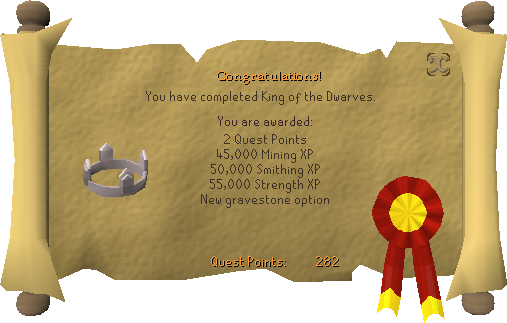 This quest is part of a series of quests known as 'Rise of the Red Axe'. The Red Axe is one of eight mining companies belonging to the Consortium which rules over Keldagrim. The Red Axe company is led by Hreidmar, who is plotting to take over Keldagrim with the help of the chaos Dwarves.